“Guardians of the Galaxy” was a surprise hit in August of 2014. How could a Marvel movie be a “surprise hit” exactly? Because the movie didn’t star a man in an iron suit or a guy with an indestructible red, white, & blue shield or a hulking, angry green monster for that matter. 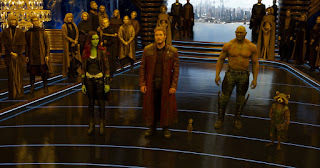 For all intents and purposes “Guardians of the Galaxy” was a practically unknown property to the masses and writer/director James Gunn turned what could have been a confusing mess (like “Green Lantern” or “John Carter”) into one of the best and most unique comic book films in quite some time. “Guardians of the Galaxy Vol. 2” offers all the great stuff that was featured in the first film including fun, irreverent humor, great chemistry among its top-notch cast, a catchy soundtrack, and spectacular action sequences. Even if a bit of the surprise factor is gone, which is inherent in a sequel, this second chapter delves deeper into the characters and is simply a delight from start to finish. 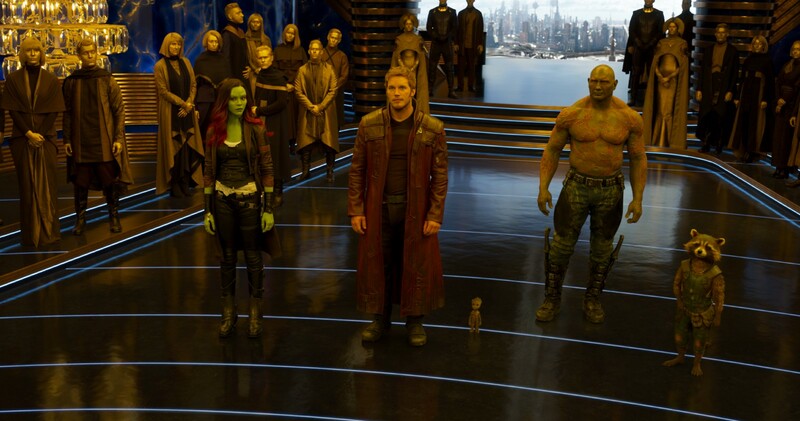 “Guardians of the Galaxy” feels so fresh because it feels so far removed from the rest of the Marvel cannon. And yet they’re supposed to come together eventually but for now most of the story doesn’t involve anyone related to an Avenger as far as I could tell. This time we learn a lot more about Peter Quill (aka Star-Lord) and his father. We learn in the previous entry that he’s actually only half human. His father was some kind of non-earthling. In a cheeky bit of genius casting, the father of the charming and hunky Chris Pratt is played by the charming and hunky Kurt Russell. Peter’s dad is none other than Ego, a cosmic being from another planet, but the less known about him the better. Ego isn’t the only new character to show up in “Guardians of the Galaxy Vol. 2.” You’ll recall at the end of the last film that gigantic tree creature and fan-favorite Groot seemingly sacrificed himself. Rocket replanted him and Baby Groot was born. He appeared briefly dancing in his flower pot, but Baby Groot appears here and he’s cute as ever running around with his trademark “I am Groot” line over and over again. There’s also a lot more going on here which involves the Sovereign race of gold colored super-beings and their leader Ayesha (Elizabeth Debicki) which involves the Guardians defeating a gigantic, scary monster in the film’s brilliant opening title sequence. Sylvester Stallone shows up as a Ravager leader who has some unfinished business with Michael Rooker’s Yondu. Howard the Duck pops up again and the film’s Awesome Mix soundtrack is as groovy as ever.